Nobody wants to think about having to replace their garage door opener but unfortunately these units are subject to wear and tear after extensive use. This means that at some point you may need to consider replacing or repairing some of the opener's parts, or the unit itself, if things are not operating properly. If you're having issues with your opener, our experts can troubleshoot the problem you're having and perform any necessary repairs. Whilst some units are naturally noisier than others, if yours suddenly sounds like it's struggling, this can be a sign that it is about to give out. A sudden or gradual increase in noise could indicate that the opener chain needs lubrication or that your opener's motor gear needs looking at. We recommend that you stop using the door for now and call our experts as soon as possible. Our professional technicians will quickly identify and fix the problem. 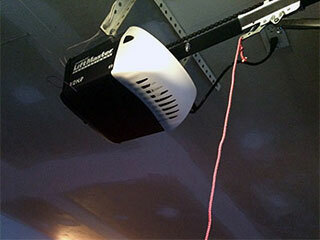 Garage door openers do sometimes appear to die without warning. When this happens, nothing will move when you push the button. We will examine your unit and determine if the cause is likely to be an electrical issue, worn motor gear or something else. Whatever it is, we'll repair the problem on the spot. There are a range of things that can go wrong with openers, luckily our professionals at Garage Door Repair Layton are trained to recognize and deal with them all. If your opener isn't working the way it should be, just give us a call.